This article is about the Scottish town. For other uses, see Stornoway (disambiguation). Stornoway (/ˈstɔːrnəweɪ/ ( listen); Scottish Gaelic: Steòrnabhagh) is the main town of the Western Isles and the capital of Lewis and Harris in Scotland. The town's population is around 8,000, making it by far the largest town in the Hebrides, as well as the second largest island town in Scotland after Kirkwall in Orkney. 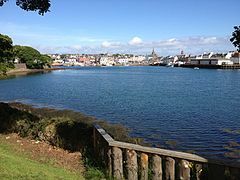 The traditional civil parish of Stornoway, which includes various nearby villages, has a combined population of just over 10,000. Stornoway is an important port and the major town and administrative centre of the Outer Hebrides. It is home to Comhairle nan Eilean Siar (the Western Isles Council) and a variety of educational, sporting and media establishments. Observance of the Christian Sabbath (Sunday) has long been an aspect of the island's culture. Recent changes mean that Sunday on Lewis now more closely resembles Sunday on the other Western Isles or the mainland of Scotland. The town was founded by Vikings in the early 9th century, with the Old Norse name Stjórnavágr. The settlement grew up around a sheltered natural harbour near the centre of the island; people travelled to Stornoway from all over the island, either by family boat or by horse-drawn coach, for onward travel to and trade with the rest of Scotland and further afield. At some point in the mid 1500s, the already ancient MacLeod castle in Stornoway 'fell victim to the cannons of the Duke of Argyle'. By the early 1600s rumbling trade wars came to a head, and all further government attempts to curtail traditional shipping rights were firmly resisted by the islanders, as was an attempt by James VI, King of Scotland, to establish on the island the Scottish trading company known as the Fife Adventurers around 1598. As a result, James VI transferred Lewis to the MacKenzies of Seaforth in 1610. In 1844, the MacKenzies sold Stornoway, and the Isle of Lewis as a whole, to Sir James Matheson (and his descendants) who built the present Lews Castle on a hill overlooking the bay of Stornoway. 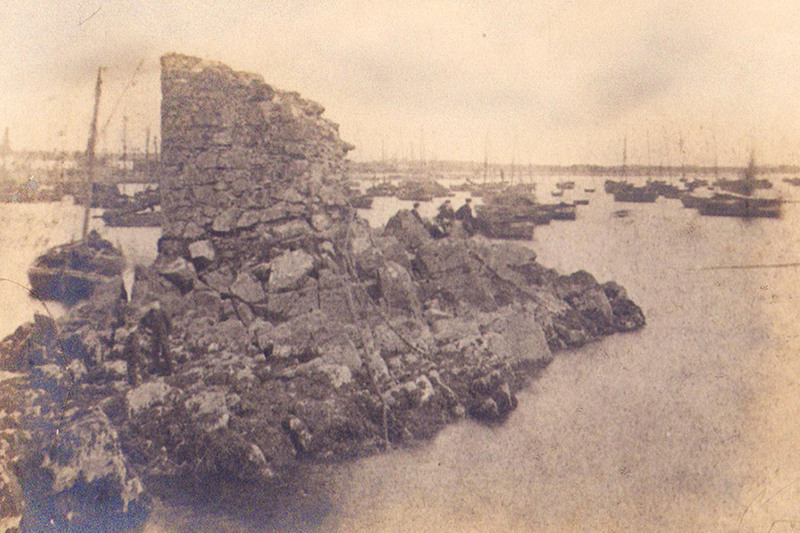 Fragmentary ruins of the old Stornoway Castle had survived in the bay until that time, and can even be seen in Victorian photographs, but Matheson destroyed them in 1882, in order to expand the harbour; a few remains of Stornoway Castle still remain, hidden beneath pier number 1, close to the shore, slightly west of centre. In 1918, Matheson sold the island to William Lever, 1st Viscount Leverhulme. Lord Leverhulme held the island for a short time. His economic plans for the island (together with various business setbacks) overstretched his finances. Faced with failure in Lewis, he gave Stornoway parish to the people of the town. The Stornoway Trust was formed and continues to administer the parish for the people. Today the harbour hosts a fishing fleet (and associated shoreside services) somewhat reduced from its heyday, a small marina and moorings for pleasure craft, a small shipyard and slipway, three larger piers for commercial traffic and Stornoway Lifeboat Station, run by the RNLI and home to a Severn-class lifeboat, Tom Sanderson. Her Majesty's Coastguard operates a Maritime Rescue Sub Centre from a building near the harbour. A lighthouse, seaweed processing plant and a renewable energy manufacturing yard are situated on Arnish Point at the mouth of the harbour and visually dominate the approaches. Arnish Point is also earmarked by AMEC as the landfall for its proposed private sub-sea cable which would export the electricity generated from the Lewis Windpower wind farm with a planning application for 181 turbines submitted to the Scottish Executive. In 2008 the Scottish Government rejected the plans - the company responsible is currently planning their next move. The Arnish area was also surveyed by SSE for a second sub-sea cable but lost out in favour of Gravir to the south as the preferred site. SSE prefers Arnish Point as of 2016. The manufacturing yard was originally established in the 1970s as a fabrication plant for the oil industry but suffered regular boom and bust cycles. The downturn in business from the North Sea oil industry in recent years led to a move away from serving this market. The yard is now earmarked as a key business in the development of the whole Arnish Point industrial estate and has received large amounts of funding in recent years. In 2007 the Arnish yard was taken over by its third tenant in as many years. Cambrian Engineering fell into liquidation as did Aberdeen-owned Camcal Ltd with relatively large-scale redundancies. Both firms were affected by the absence of a regular stream of orders and left a chain of large debts impacting upon local suppliers. Altissimo Ltd is a new firm backed by a group of Swiss and Dutch investors, and has purchased the Camcal name from the previous operator. In December 2007, the yard won a contract to construct 49 towers for wind turbines in Turkey. This will ensure employment for around 70 employees for over six months. On 1 January 1919, the Iolaire sank at the entrance of the harbour, one of the worst maritime disasters in Scottish or UK waters, with a death toll of 205 men, who were returning home from World War I. Like much of the British Isles, Stornoway has an oceanic climate, with relatively little variation of temperature and damp conditions throughout the year.. Winters are exceptionally mild for such a northerly location; average nighttime low temperatures in January and February, the coldest months, are above 2 °C (36 °F), while daytime high temperatures average about 7 °C (45 °F). Summers are cool, due to influence from the Atlantic Ocean; average daytime high temperatures in July and August are just over 16 °C (61 °F). Precipitation falls mostly as rain (though snow occasionally falls in winter), and October through January are the wettest months due to frequent, sometimes intense storms from the North Atlantic, which can bring heavy rain and high winds. April through July represents a markedly drier season, when storm frequency and intensity diminish markedly. June is the driest month in Stornoway, averaging at 62.1 mm (2.44 in) of precipitation, while January is the wettest month, averaging at 148.3 mm (5.84 in). The Caledonian MacBrayne-operated ferry MV Loch Seaforth has been sailing since 2015, from Stornoway harbour to Ullapool on the Scottish mainland, taking 2 hours 30 minutes. There are an average of two return crossings a day: more in summer than in winter. The former main ship on the route, MV Isle of Lewis (1995), used to carry the freight crossing, however she has now been reassigned elsewhere by CalMac. This means that MV Loch Seaforth is often heavily congested, particularly during the summer months. The idea of an undersea tunnel linking Lewis and Harris to the Scottish mainland was raised in early 2007. One of the possible routes, between Stornoway and Ullapool, would be over 40 miles (60 km) long: the longest road tunnel in the world. Stornoway is the hub of bus routes in Lewis: buses run to Point, Ness, Back and Tolsta, Uig, the West Side, Lochs and Tarbert, Harris. These buses are provided by the Comhairle and several private operators as well as some community-run organisations. Stornoway Airport is located next to the village of Melbost, 2 miles (3 km) east of the town; there are flights to Aberdeen, Benbecula, Edinburgh, Inverness and Glasgow, operated by Loganair and Flybe franchisee Eastern Airways. The airport is also the base of an HM Coastguard Search & Rescue Sikorsky S-92 helicopter, and was previously home to RAF Stornoway. In 1898, the Hebridean Light Railway Company was proposed, with a terminus at Stornoway, but the line was never constructed. Cruise ships visit the town and anchor in the bay, with passengers coming ashore on tenders. Stornoway is home to the Nicolson Institute: founded in 1873, it is the largest school in the Western Isles and the only secondary school in Lewis providing a six-year course. It has a roll of around 1,000 pupils. After a two-year rebuilding project costing £29 million, the new school building was formally opened in October 2012. Primary education in Stornoway is in Stornoway Primary School, which opened in August 1969. The school is on Jamieson Drive and has around 400 pupils. The head teacher is Annette Murray. There is also a small campus of the University of Stirling in Stornoway, teaching nursing, based in the Western Isles Hospital. It provides undergraduate degree programmes for adult nursing and supports postgraduate students, who can choose from various higher level courses. Football is the most popular amateur sport and Goathill Park in the town hosts special[clarification needed] matches involving select teams and visiting clubs and other organisations. Two local teams currently participate in the Lewis and Harris Football League: Stornoway Athletic (Aths) and Stornoway United. Until the early 1990s there was also Stornoway Rovers. Stornoway United FC usually win the Manor Dairy Football Competition. Shinty is not as popular as in the rest of the West of Scotland, but the Lewis Camanachd team is based around the town. Rugby Union is also popular, and Stornoway RFC competes regularly in national leagues and cups. The town also has a very popular gymnastics group which competes annually in sports festivals. The Lews Castle Grounds is the home of Stornoway Golf Club (the only 18-hole golf course in the Outer Hebrides). Very near to the Nicolson Institute is the Lewis Sports Centre (Ionad Spors Leòdhas), which has a sports hall, fitness suite, climbing wall, swimming pool and various other facilities. It has a running track and an AstroTurf Football pitch. There is also the Stornoway Karate Club, a member of the International Japan Karate Association. According to the 2011 Census, there are 5,492 Scottish Gaelic speakers (43%) in the greater Stornoway area. The annual Hebridean Celtic Festival is a 4-day community-led festival which attracts over 10,000 visitors during July of each year. The Royal National Mòd has been held in Stornoway on a number of occasions, most recently in 2005, 2011 and 2016. Large influxes of visitors such as for these events can strain the town's accommodation capacity. Stornoway is a sister town of Pendleton, in Anderson County, South Carolina, United States. The radio station Isles FM is based in Stornoway and broadcasts on 103FM, featuring a mixture of Gaelic and English programming. It is also home to a studio operated by BBC Radio nan Gàidheal. The Gaelic-language public service broadcaster BBC Alba launched on 19 September 2008, is based in Stornoway. Stornoway Library operates a five day opening service from Tuesday to Saturday, with a late night opening on Thursday evenings. The library offers book borrowing services as well as free access to wifi and computer access to the internet. As part of its collections, the library offers access to a wide range of Gaelic materials, with a large collection of books and periodicals such as Gairm, Transactions of the Gaelic Society of Inverness, Scottish Gaelic Studies and Guth, as well as out of print publications An Gaidheal and Guth na Bliadhna. In their newspaper section, the library holds copies of Alba and Mac-Talla as well as Sruth, Scotland's only bilingual newspaper from the 1960s. Through the library membership, it is also possible to access An Stòr-dàta Stuthan Gàidhlig, a database of Gaelic educational resources. Stornoway Library also holds an extensive local studies collection for research purposes. As part of those collections, the library holds an archive of local newspaper back editions including the Stornoway Gazette from 1917, the Highland News from 1883, the West Highland Free Press from 1972, the Oban Times from 1861, the Inverness Courier from 1817, the Inverness Advertiser from 1849 and the Inverness Courier and Advertiser from 1885. Other resources include a collection of ordinance survey maps and admiralty charts for the local area, old parochial registers, 19th century census returns, minutes of the former Stornoway Town Council as well as current Comhairle nan Eilean Siar and school log books. The library also holds the Seaforth Muniments (Seaforth Estate Papers), local croft histories and rental and valuation rolls dated as far back as the 18th century. In 2018, Stornoway Library announced plans to transform their coffee shop into a makerspace available to the general public where they run educational activities on topics including 3D printing and virtual reality. The main local newspaper for the Western Isles is the Stornoway Gazette. Stornoway black pudding is a gourmet black pudding, and was granted PGI status in 2013 by the European Commission to prevent inferior puddings produced elsewhere being marketed as "Stornoway" or "Stornoway Style". Stornoway kippers and Stornoway smoked salmon are produced in town. They have one of the last working brick kilns in the UK, at the establishment of Stornoway Fish Smokers, Shell Street. The Hebridean Brewing Company produces cask ale and filtered beer in bottles. Stornoway became immortalised in the song "Lovely Stornoway" by Calum Kennedy and Bob Halfin. The 4AD Records folk-rock band Stornoway took their name from the town, after seeing it on the BBC weather report. They signed their record deal outside the Woodlands Centre in Lews Castle Grounds, Stornoway, after performing in the town for the first time in April 2010. Their second concert there was as headliners on the main stage of the Hebridean Celtic Festival on 13 July 2011. "Stornoway" is the name of the official residence of the Leader of the Opposition in Canada's Parliament. It was given the name by its second occupants, the Perley-Robertsons, after the ancestral home of the Perley family. The novel The Stornoway Way by Lewisman Kevin MacNeil is largely set in Stornoway. RAF Stornoway is featured in the Tom Clancy novel Red Storm Rising as a base for Allied air operations over the North Atlantic and against Soviet-held Iceland. Stornoway features heavily in the initial stages of the X-Men comics Dark Phoenix Saga due to its proximity to the fictional Muir Island and Proteus' attempts to find a new host body. In the motion picture Latitude Zero by Toho Productions (1969), Stornoway Harbour is featured on a wall plaque as the construction site of the submarine "Alpha". In 2007 the British car manufacturer Land Rover introduced Stornoway Grey as a colour choice for its vehicle line-up. In response, Stornoway's councillor Angus Nicolson appealed to Land Rover to relabel the colour as Silvery Stornoway, fearing that the association of grey with dull and boring would hurt the image of the town with tourists; Mr Nicolson said: "This is deeply insulting and is offensive, inaccurate and inherently degrading. This will hit tourism as it subliminally implants adverse connotations in the minds of those who have never experienced the reality of these beautiful islands." Land Rover replied that the colour in question is one of the most popular ones and the use of Stornoway in its name will instead "keep it on the map". In 2011 Scottish author Peter May published The Blackhouse, the first of The Lewis Trilogy of thrillers based on Lewis, where the primary police murder investigation is based in Stornoway. Stornoway has several churches of various Christian and non Christian denominations. In May 2018, the first mosque of the Western Isles opened to serve a small Muslim population. Until July 2009, there were no Sunday ferry services to or from Stornoway. It was announced on 14 July 2009 that Caledonian MacBrayne would begin to operate Sunday sailings from Sunday 19 July 2009. Before this, they would operate additional sailings on Sundays if several previous sailings have been cancelled, to allow the backlog of traffic to clear. Caledonian MacBrayne have said that they took legal advice that not implementing Sunday sailings would be against human rights legislation. There are Sunday flights leaving from Stornoway Airport with two return flights to Inverness and one to Glasgow. Alice Starmore, (née Alice Matheson), a professional needleworker, photographer and author of books on needlework. ^ Weather station is located 2.4 miles (3.9 km) from the Stornoway town centre. ^ a b "Stornoway Profile". Highlands & Islands Enterprise. May 2014. Retrieved 3 August 2015. ^ "Factfile - Population". Comhairle nan Eilean Siar. Retrieved 10 September 2017. ^ "Stornoway - History". Virtual Hebrides. Retrieved 19 September 2014. ^ a b "The Principal Clans and Private Landlords of Lewis". www.angusmacleodarchive.org.uk. Retrieved 19 September 2014. ^ a b "History of the Lews Castle". Stornoway Historical Society. Archived from the original on 7 December 2014. Retrieved 19 September 2014. ^ "Stornoway Harbour". Visit Outer Hebrides. Retrieved 3 August 2015. ^ "Stornoway Lifeboat Station". RNLI. Retrieved 3 August 2015. ^ "History of Stornoway Coastguard". Stornoway Coastguard. Retrieved 3 August 2015. ^ "BBC". BBC News. 30 March 2007. Retrieved 6 January 2010. ^ "Yard wins biggest wind tower job". BBC News online. 10 December 2007. Retrieved 22 December 2007. ^ "Iolaire Memorial". Gazetteer for Scotland. Retrieved 3 August 2015. ^ "Stornoway 1981–2010 averages". Met Office. Retrieved 14 March 2019. ^ "Indices Data - Stornoway Airport Station 427". KNMI. Retrieved 14 March 2019. ^ Kelbie, Paul (7 February 2007). "Independent". The Independent. London, UK. Archived from the original on 20 December 2007. Retrieved 24 May 2010. ^ "Stornoway Today". Archived from the original on 8 February 2007. Retrieved 10 November 2016. ^ "The Nicolson - Past, Present & Future". The Nicolson Institute. Retrieved 18 August 2015. ^ "School Handbook" (PDF). The Nicolson Institute. Retrieved 18 August 2015. ^ "Domesday Reloaded - 1986 Stornoway North - Education". BBC. Retrieved 18 August 2015. ^ "Stornoway Primary School". Education Scotland. Retrieved 18 August 2015. ^ Smith, Iain (26 September 2013). "A meeting in Stornoway, and the good that followed it". Scottish Review. Retrieved 18 August 2015. ^ "Welcome to Lews Castle College UHI". UHI. Retrieved 18 August 2015. ^ "History of the Lews Castle". Stornoway Historical Society. Archived from the original on 7 December 2014. Retrieved 18 August 2015. ^ "Western Isles Campus". University of Stirling. Retrieved 18 August 2015. ^ "Census shows Gaelic declining in its heartlands". BBC News. 15 November 2013. Retrieved 20 April 2014. ^ info@reefnet.co.uk. "An Comunn Gàidhealach - Royal National Mod : Royal National Mod". www.ancomunn.co.uk. ^ "Comhairle nan Eilean Siar - Stornoway Library". www.cne-siar.gov.uk. Retrieved 17 March 2019. ^ "Comhairle nan Eilean Siar - Gaelic Collection". www.cne-siar.gov.uk. Retrieved 17 March 2019. ^ "Comhairle nan Eilean Siar - Local Studies Collection". www.cne-siar.gov.uk. Retrieved 17 March 2019. ^ "From Library Coffee Shop to Community Creative Space". www.welovestornoway.com. Retrieved 17 March 2019. ^ "Stornoway black pudding given protected status". BBC News. 8 May 2013. Retrieved 11 December 2013. ^ "the islands' annual flagship event! : Hebridean Celtic Festival". ^ "Grey shade too far for councillor". BBC News. 9 March 2007. Retrieved 31 May 2011. ^ "Brit town protests "Stornoway Grey" Land Rovers". Autoblog. 12 March 2007. Retrieved 31 May 2011. ^ "Western Isles' first mosque built ahead of Ramadan". BBC News Online. 11 May 2018. Retrieved 15 May 2018. ^ a b "BBC Scotland News". BBC News. 14 July 2009. Retrieved 6 January 2010. Chisholm, Hugh, ed. (1911). "Stornoway" . Encyclopædia Britannica (11th ed.). Cambridge University Press.